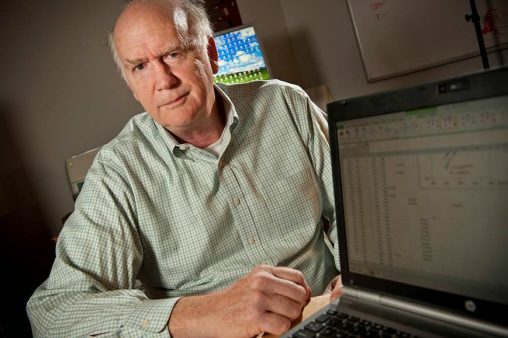 In a paper in the Valdose Zone Journal, Wright State physics professor Allen Hunt detailed a formula to optimize the growth of cultivated vegetation while providing a more accurate way to measure water resources and predict climate change. A new mathematical model that promises to optimize the growth of cultivated vegetation while providing a more accurate way to measure water resources and predict climate change has been developed by Wright State University physics professor Allen Hunt. Hunt’s formula is detailed in a paper published by the Valdose Zone Journal. The journal is published by the Soil Science Society of America, the largest soil-specific society in the United States. The amount of water and solar energy together control a plant’s production of sugar, which provides the energy for plants to create new cells and grow. If plants are not watered, their growth is limited by the amount of water they are able to draw from the soil. That’s why jungle vegetation, for example, grows much faster than that in the desert. The transpiration rate also affects how much carbon dioxide vegetation draws from the atmosphere, which can impact global warming. The formula also has the potential of being used by farmers to more accurately calculate the optimal amount of watering and fertilizing to maximize crop productivity. Keeping fertilization to only the amount needed would have positive environmental benefits. “This is an example of a physics project overlap in biology with significant implications across the spectrum, including in conservation agriculture,” said Hunt. The formula could also potentially be used to more accurately measure the mass of trees in tropical forests because the height of those trees is difficult to measure and virtually impossible to do. “Knowing how much mass there is in a forest tells you how much water it takes out of the ground and how that affects water supplies for human and animal populations, as well as lake and stream levels,” Hunt said. Hunt has recently had other related research papers published. Water Resources Journal published his paper on a new mathematical model that can be used to more precisely predict the degree of global warming by measuring soil production. And Chaos, a physics journal, published a paper by Hunt and physics professor Thomas Skinner that accurately predicts the rate at which soil develops from the surface to the underlying rock, which could answer questions about greenhouse gases and has potential applications in agriculture.